Arena Financing 100% Public General obligations bonds issued by City of Nashville. Naming Rights Gaylord Entertainment Company will pay $80 million over 20 years beginning in 1999. Rose Carter did something she never thought she'd do -- go into a hockey player's locker room. The Hermitage woman was among more than 26,000 people who converged on the new arena for its free grand opening to the public Sunday afternoon. Along with visiting the plush suites, upper-deck seats, backstage area and the main floor where hockey, basketball and arena football will be played, thousands also toured the locker rooms and dressing rooms. Other popular pursuits in the basement included inspecting the Zamboni, the vehicle that resurfaces the ice rink, checking out the rink's ice machine and wandering around in the area where the media will interview people and develop photographs. The sunny, warm Sunday afternoon and festive atmosphere -- music and free sodas and hot dogs for everyone -- were just what the arena officials had hoped for, said Russ Simons, vice president of Leisure Management International, the arena's manager. "This is for me the final period in the end of the sentence, turning it over to the public,'' said Mayor Phil Bredesen. "I'm a very happy guy,'' Simons said. On May 13, 2003 Ryan Voshell wrote: The Gaylord Entertainment Center is a great hockey building, even if the hockey played in it isn't always great. In a southern, football crazy city, it had to be a great building to draw interest to hockey. The building is easy to navigate and there is always a concession stand and restroom nearby. There is not a bad seat in the house, and that is from someone who has sat everywhere between the second row to the very top row. On most nights you will see a country music star or a member of the Titans in attendance. When the hometown Predators score a goal, fans seated near a giant can ofEdge Shave Gel get showered by confetti. Fans in Nashville expect a good effort from it's players every night, fueled by the success of the Tennessee Titans. There is often unfair expectations placed on the Predators because of that, but the fans continue to learn and appreciate the game. The GEC was named loudest building in the NHL in it's first season and a banner hangs to recognize the Predators 7th man "The Fans". The loudest section by far has to be section 303, also known as "Cellblock 303" where colorful chants and cheers rain down to the ice throughout the entire game. Although the building hasn't seen the best hockey from the Predators yet, it does seem to bring out the best individual performances by visiting players. The one moment that stands out most above all others, is the night that the Ney York Rangers visited with Wayne Gretzky. It was The Great One's only game in the GEC and he did nothing to tarnish his reputation by racking up five assists. Fans have seen great performances by the likes of Peter Forsberg, Kieth Tkachuk and Luc Robitaille. Although the fans appreciate these efforts, nothing will get the building rock like a big hit from Scott Hartnell, a last second goal by Scott Walker or a sensational save by goaltender Tomas Vokoun. It is a very exciting time to be a hockey fan in Nashville, with a feeling that the Predators are right on the edge of becoming a top contender. And when the team finally turns the page and moves to the next level, there will be no better building to watch a game in than The Gaylord Entertainment Center. * The Arena design features a 22-story tower that houses in its base the Nashville Convention & Visitors Bureau visitors' center and a small theater. * Four thousand (4,000) amps power located in two backstage areas. Designated house electricians to make all connections. Arena seating bowl lighting consists of metal halide floodlights with 3400 Ok lamp color temperature and 65 minimum color rendering index to provide light levels ranging from 30 foot candles in the horizontal plan for conventions, tradeshows, etc., and a minimum of 200 foot candles in the vertical plane for televised events. Located at the South end of the building and accessible through the service ramp at Sixth Ave. and Clark Place, the 30,000-sq. ft. loading dock can accommodate up to 24 buses and trailers. Dock entrance 20' x 16'7" with direct floor access through 22'x15' door. Overhead door and closed circuit cameras ensure security. One (1) Class C1 10,000-lb.-capacity traction elevator equipped with 8' x 8' bi-parting doors accessible to high steel (125) feet. A second similar sized freight elevator with access to each level is dedicated to food service operations. Twelve (12) spotlight platforms equipped with four (4) Super Trooper II's and eight (8) Strong Gladiator III's. One (1) 40'x60' stage with 12' x 24' sound wings featuring bridging or floating deck design, complete barricade system and ADA compliant ramp. Five (5) star dressing rooms ands three (3) team/chorus dressing rooms each equipped with bath and shower facilities located in immediate backstage area. 1,500 sq.ft. equipped with catering pantry and two (2) separate bath and shower facilities. Tubes and "H" beams are located 125' from floor in a square grid pattern, approx. 10'-12' between beams with a total end stage live load capacity of 120,000 lbs. and a total center stage capacity of 80,000 lbs. Maximum pick point capacity ranges from 4,000 lbs. to 8,000 lbs. per tube or beam. All rigging plans, including desired hanging points, must be submitted to The Gaylord Entertainment Center operations department prior to tickets going on sale. Safety lines are required on all rigging points located over seating area. Four (4) offices located in immediate backstage area equipped with telephone and cable TV outlets. 1,800 sq.ft. dining area located in backstage area. Full-service ticket office providing computerized ticketing, remote outlets and telephone order service for all events. Daily ticket office with fifteen (15) windows located at main entrance and event ticket office with five (5) windows located at south entrance. Daily WILL CALL ticket pick up, dedicated credit card windows and ATMs are available for patron services. Local off-duty police officers, private uniformed security guard service and peer group security available. Six (6) public address sound clusters located in the high steel supported with nine (9) sound delay speakers at the sound end. Seating for patrons with disabilities is available on each level. Accessible parking is available in attached garage and all entrances into the arena are accessible. PHONIC EAR is available on request and T.D.D.s are located at phone banks on the main concourse level. All concession stands and restrooms (including eight (8) unisex restrooms) are accessible. Follow Nashville signs and exit on Broadway (209B). Turn left on Broadway and Nashville Arena will be on your right, between 6th and 5th Avenue. Follow I-40, take the Memphis fork, exit on Broadway (209A). Turn right on Broadway and Nashville Arena will be on your right, between 6th and 5th Avenue. Stay North on I-65 to I-40 West towards Memphis, exit on Broadway 209A). Turn right on Broadway and Nashville Arena will be on your right between 6th and 5th Avenue. Follow I-40 West towards Memphis, Exit on Broadway (209A). Turn right on Broadway and Nashville Arena will be on your left between 6th and 5th Avenue. Follow the 265 Memphis loop, take the 40 West fork following the Nashville signs. Exit on Broadway (209A), turn left on Broadway and Nashville Arena will be on your right between 6th and 5th Avenue. Gaylord Entertainment Co will pay $80 million over 20 years for naming rights to the Nashville Arena. The venue will be called the Gaylord Entertainment Center. The venue is home of the NHL Predators, which are 20% owned by Gaylord. The team gets all naming rights revenue. January 8, 2000 - The Gaylord Entertainment Center sits amidst the core of downtown Nashville and is at what you could call the epicenter of the the country music world. Across the street from this building sits the old Ryman Auditorium which was the showplace that made the Grand Ole' Opry an American institution. On the opposite side of the arena sits the new home of the Country Music Hall of Fame and Museum set to open in May 2001. And outside the arena you will see the building's signature structure, a 22 story tower meant to symbolize a radio tower that would broadcast events from the Ryman once upon a time. Once you enter the building from the main entrance you step into an impressive lobby with high ceilings, balconies from which those in the upper concourses can look down into the lobby from, and the escalators that take people up to the upper levels. The floor of the lower concourse appears to have a mural of a continous musical score piece going continously around the oval. There are many plaques on this to commemorate the many sold out events that had played here in the arena's short existence. Unfortunately, one of the plaques was there in honor of Dr. James Dobson and his Focus on the Family, one of the pillars of hate and intolerance in our society. As with most other venues, plenty to eat and drink, and don't forget to make a stop at the Predators Pro Shop at the base of the signature tower. Step inside the bowl from the concourses and you will see a seating area that varies a bit differently from most other arenas we have seen. Yes, there are large lower and upper seating areas and a small club level with suites. However this design exists only from the end of one sideline around behind one of the nets to the end of the other sideline. In the remaining sections behind the other net there is not as much of a club level and the upper seating level is lower and closer to the ice than in the rest of the building. An asymmetrical design unique to Nashville as we were split as to whether this was a cool thing or not. The bowl was decked out in team colors which was a cool thing to us. As we said before we had just been forced to suffer through the debacle of the Music City Miracle and we were bracing ourselves for the reaction in the building that night. As expected they replayed it on the Jumbotron during a break in play, then came something during another break that gave me the urge to take my Predators jersey off and burn it right on the spot. They showed a Jeopardy style trivia question that went something like this....A. Scott Norwood, Brett Hull, and Frank Wycheck. Q. Name three players who broke the hearts of Buffalo fans?? THAT DOES IT!!!! LET'S GO BLACKHAWKS!!!! We definitely thought that one went a bit too far. On the other hand we did see a funny movie clip later on. With time winding down and the Preds scoring an empty net goal to seal a 6-3 win, the Jumbotron showed a clip of a, shall we say "fuller figured" woman dressed in opera garb belting out a high note. Definitely a classic clip we have not seen anywhere else!! The Predators began play as an expansion team in 1998 so there is not much history here yet. Still that didn't stop the team from retiring the number 7 in honor of their fans. Of course seeing that just gave us one more reason to be sick to our stomachs. We couldn't decide which banner was more insignificant, that one or the one signifying an Arena Football League Conference Championship. As you may be able to tell we didn't really care for this place. We'll give this building the benefit of the doubt though, considering that we were still deeply saddened and angered to the point of numbness. The events of the afternoon frustrated us to the point that as we left for home the following morning we swore to ourselves we wouldn't spend another penny on anything until we crossed the border into Kentucky. If we got the chance to get back (Grizzlies) for another event (Grizzlies) I'm sure we would give this place a better rating. The Tennessee Titans and the Nashville Predators have gone to the Metro Sports Authority with requests for new scoreboards at their venues. The total cost is estimated at $7.1 million. The Titans want $3.54 million for new end-zone scoreboards to be installed before the upcoming season. 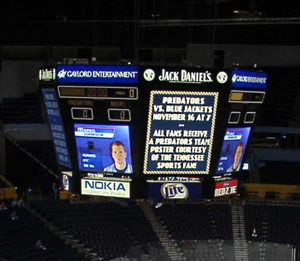 The Predators want a $3.6 million scoreboard at the Gaylord Entertainment Center to be in place for the 2007 season. Both teams say their current boards are out-of-date and there that replacement parts are becoming scarce. The Titans have agreed to fund the cost of the scoreboard and allow the government to repay them by the fall of 2008. Each structure at The Coliseum would feature a 24- by 90-foot video board, a 12- by 32-foot, fixed-digit scoreboard and a 12- by 32-foot digital advertising display, according to the proposal the Titans received from Daktronics, the South Dakota-based company that would install the boards. The Coliseum's existing scoreboards have been in place since the stadium opened in 1999 and are springing leaks. The firm that built the scoreboards is now out of business. At the Gaylord Entertainment Center, JumboTron is at risk of failing because Sony stopped making replacement parts in 1999. The arena has few spare parts on hand. Building managers say the work is needed to keep the building competitive with other regional venues, including the new FedEx Forum in Memphis. The building also bids for concerts and events such as Southeastern Conference basketball tournaments. Nashville, Tenn. - The Nashville Predators' owners might buy thousands of unsold tickets so they can qualify for a full share of the NHL's revenue-sharing plan, the team's lead owner confirmed. David Freeman stressed that he and the other owners haven't made that decision, but with millions of dollars on the line, they've been discussing the possibility and they can't wait too long to pull the trigger. Through 22 home games, the Predators' average paid attendance stands at 13,744, said Ed Lang, president of business operations. That's 256 tickets short of the 14,000 average required for a full share of the NHL revenue-sharing pool. The team also must increase its revenue at the same rate as the rest of the league to qualify. That means the owners can't just buy up tickets on the cheap to get to the attendance requirement, Freeman said, adding that they would buy them at market rates. Teams that don't fully meet the criteria can receive partial revenue shares, Lang said. For example, falling just short of one target might mean a 75 percent share. The revenue-sharing plan was worth a full share of about $12 million to the Predators after the 2007-08 season. The plan exists for small-market clubs like Nashville, which receive money from a pool the NHL collects from the 10 highest-earning teams. Nashville, Tenn. - Trying to increase revenues wherever they can, the owners of the Nashville Predators are looking at one of the only major assets they have that isn't on skates: their building. The pro hockey team, which has a lease there for 19 more years, is exploring the possibility of developing parts of the arena as shops and restaurants accessible from surrounding streets. David Freeman, leader of the Predators' ownership group, said retail could fit in nicely with a proposed new convention center and hotel, which Mayor Karl Dean hopes to open by the start of 2013. The convention center campus would be across Demonbreun Street from Sommet. Freeman and Arnett Bodenhamer, chairman of the Metro Sports Authority, the Predators' landlord, said they would have to consult the lease to see what's possible. Some amendments could be necessary, Bodenhamer said. The agreement says clearly that the sports authority must approve in advance any arena alterations or improvements costing more than $25,000. Freeman sees great potential. Sommet is on the edge of Lower Broadway, where the honky-tonks and country music-themed gift shops reel in tourists and Middle Tennessee residents alike. The Ryman Auditorium and Country Music Hall of Fame are nearby. Nashville, Tenn. - The Nashville Predators hockey club could owe the Metro government almost $400,000 in seat taxes that the team apparently has been withholding from the city without its knowledge. A new lease agreement the team signed with Metro last April, retroactive to July 2007, says the club is supposed to pay the city a $1.75 fee per ticket sold for hockey games. That money is meant to offset Metro's expenses at the city-owned Sommet Center. The team hasn't been paying the full amount, according to totals on ticket settlement statements the team filed with Metro. Team officials say they were operating under a provision in the previous lease signed in 1997 that allowed them to charge 5 percent of the ticket price or $1.75 - whichever was less. That meant some cheaper seats had a lower ticket user fee. When asked about the apparent discrepancies in payments, the team's president for business operations, Ed Lang, could not provide a clear explanation. He acknowledged there was a difference in the language of the lease. He cited a term sheet submitted during negotiations in November 2007 that the seat user fee would remain "at current levels." The term sheet was an early road map for drawing up the lease, which eventually went through many drafts before being approved by the city in April 2008. One of the drafts dated February 2008 highlighted changes to the agreement. It clearly shows the 5 percent provision was eliminated. "It changed," Lang said. "We're trying to figure out, 'Did something in the negotiations change?' I'm relying on our attorneys right now. They're reviewing it." He said both sides had been operating under the belief that there was not a change. But there's no indication from the record that Metro tracked the seat use fee very closely. Through regular-season home games this year the team reported paid attendance of 471,083, according to Metro records. At $1.75 per ticket, that would be about $825,000 in ticket taxes. But the team reported fees to the city of approximately $605,000 - or an approximate $220,000 shortfall. That does not include preseason games or a couple of recent games of which reports were not available. Last season, the team reported paid attendance of 600,043 for the regular season and playoffs. Nashville, Tenn. - Metro's chief negotiator in the Nashville Predators deal said that he and the team's lawyers messed up when they drew up the team's renegotiated lease with Metro for use of Sommet Center. Larry Thrailkill, a private attorney who represented Nashville during the negotiations, responded to a story that questioned whether the team was following the terms of a renewed lease agreement as approved last April. The contract said the team should pay Metro a $1.75 fee for each hockey ticket sold. The newspaper estimated that under those terms the city could be owed nearly $400,000 over the past two years. Thrailkill said lawyers drafted the lease incorrectly, but the intent was to maintain the old lease's seat user fee structure. That included a provision which called for the team to pay the city 5 percent of the ticket price or $1.75 per ticket sold - whichever was lower. The 5 percent was dropped from the new lease and was not caught in some 20 drafts that passed back and forth between the lawyers. The team was represented by Waller Lansden Dortch and Davis, one of Nashville's most powerful and prestigious firms. "Due to a mutual misunderstanding by the lawyers, the Amended and Restated documents omitted the 5 percent language," Thrailkill said in an e-mail. "You have identified this mistake in the drafting and it should be addressed and corrected." Thrailkill said the team had been operating under the old terms. He said that he did not believe the city could retroactively hold the Predators accountable for the payments. He added that the contract as drafted was inconsistent with state law, which allows for a maximum 10 percent seat user fee or ticket tax for events at Sommet Center. The team couldn't legally collect the full $1.75 for tickets sold for under $17.50. The team was silent on the issue. They've provided little explanation since questions were raised about the seat user fee payments. Some Metro Sports Authority members still want additional answers. The authority acts as the city's landlord at its major-league sports facilities and is charged with protecting the interest of taxpayers at these publicly owned buildings. Thrailkill acts as the board's attorney in matters related to the Predators renegotiated lease with the city. Nashville, Tenn. - A dispute between the Nashville Predators and Sommet Group has moved into court and will result in the company's name being removed from the team's arena. Team officials say the company breached its deal by not making its payments while company officials say the issue is more complicated than that. In 2005, the team and Gaylord Entertainment Co. dissolved a previous naming rights deal. Sommet became the new owner. Brian Whitfield, Sommet's managing partner, said the company stopped payment on the contract because the Predators had failed to hold up their end of the agreement. "The reason we have withheld payments is because our supposed partner in naming rights is not acting like one," Whitfield said in a statement. "We entered into the agreement with the understanding that in partial exchange for our payments, our business units would be the preferred provider of certain products and services." Those included promotional products, outsourced human resources and information technology. The team had used Sommet's competitors to purchase goods and services. The final straw was the Predators' decision to purchase promotional T-shirts to be handed out at a game from an out-of-state vendor, rather than buying them through Sommet, he said. "This goes a little bit beyond non-payment," he said. The team said the Sommet Group stopped paying its naming rights fee in August, short of its 3-year agreement which was supposed to end next year. The agreement is believed to be around $4 million annually, which is what the team collected from Gaylord for its agreement. A Sommet executive would not confirm that amount. The team said the disagreement would not impact its operations and it would look for another naming rights sponsor at the end of the season. The venue will be known as Nashville Arena until a new buyer is found. Nashville, Tenn. - The company that purchased naming rights to the Nashville Predators arena is facing new challenges in the form of a $337,161 million lien filed by the Internal Revenue Service. Sommet Group has been taken to court by the Predators who say the firm is not current on its naming rights payment. The company says the issue is more complicated and has to do with the team's purchase of merchandise from Sommet competitors. The lien goes back many years to when the firm operated under a different name. Company officials say they have no financial troubles and because it handles payroll services for other firms, that sometimes tax issues arise unrelated to Sommet. Company officials also acknowledged cash flow issues and that they are working through them with the cooperation of the IRS. Team officials say they will keep the Sommet name on the building for now, but they have acquired permission from the Nashville Metro government to change it. Nashville, Tenn. - Concerns about problems with the finances of the Nashville Predators' owners and an upcoming opening in the team's lease for the Sommet Center have members of the Metro Sports Authority worried that they could lose the team. The source of concerns stemmed from a federal tax lien against Predators majority owner David Freeman. Authority members asked the Predators to answer questions pertaining to the lien and to the team's general financial standing, but the team declined. The lien against Freeman was the latest development that has called the Predators' financial standing into question. Last month the team filed suit against the Sommet Group to terminate the naming rights agreement at the downtown arena. Six weeks ago, CIT Group, which lent the local ownership group $85 million, filed for bankruptcy protection. Additionally, William Del Biaggio, a minority owner, filed for bankruptcy. A trustee of Del Biaggio's individual bankruptcy is currently deciding what to do with his 27 percent stake in the team. The authority also wanted the Predators to answer general questions about their financial health, because a provision of their lease agreement could give them the ability to leave Nashville next year. If the Predators show a $20 million cumulative loss since the lease agreement was put in place in 2007, and if the team falls below an average of 14,000 fans paid attendance per game, then they can exercise an opt-out clause starting May 1, 2010 that would allow the team to leave town. Nashville, Tenn. - An agreement among the owners of the Nashville Predators could force them to pay more money to Nashville for use of the Sommet Center. The team already has $50 million pledged to the city, but an agreement among the owners says if one or more owners cannot meet the financial obligations of the deal, the others have to step in to cover the shortfall. The owners also signed two agreements with the NHL, one a financial guarantee for as much as $50 million and the other a consent agreement, that are far more binding than the city agreement. Those contracts give the NHL the right to be at the front of the line of any creditors and the right to revoke the franchise if it decides the owners are no longer meeting their obligations. They also do not allow any of the owners to escape financial commitments by declaring bankruptcy. Under the lease guarantee with the city, the owners only have to give the city a certificate of their net worth equivalent to their ownership percentage. They are also permitted to use their shares in the Predators in the calculation of their net worth and do not have to include any of their financial obligations to the NHL and any outside parties in the calculation. The city, which owns the Predators' arena through the Metro Sports Authority, is seeking assurances from the team owners about their financial situation. This became necessary after the news last month that David Freeman, who has the largest share of the team at 31 percent, had a $3.3 million federal tax lien placed on his house. If Freeman cannot settle the lien, he and the team could be found in default on the city guarantee. While some city officials do not think it is necessary to toughen up the guarantee, which calls for a $50 million payment from the owners if they are found in default, others do. Rusty Lawrence, the chairman of the Sports Authority's finance committee, said he was not aware of the indemnity and contribution agreement among the owners, but that he now plans to bring it to the attention of the Sports Authority committee that is negotiating with the Predators owners and add it to his list of reasons why the city's guarantee needs to be strengthened. Lawrence said the early escape clause in the team's arena lease, which allows the Predators to break it by this May if they do not reach an average attendance of 14,000 a game and post a cumulative total of $20 million in losses since 2007, should be moved to 2012. Lawrence also does not want to allow the owners to include their shares in the Predators in their net worth statements because those shares could become worthless in the event of bankruptcy and their certifications should be free of any other financial liabilities. As for making good to the city if one of the owners goes into default, Lawrence wants the guarantee to become joint and several, just like the indemnification agreement the owners made among themselves. That would force the other owners to take financial responsibility for each other. Nashville, Tenn. - The Nashville Predators will begin looking for a new naming rights sponsor for their arena, but until one is found, the venue will continue to be known as the Sommet Center. The action is the result of a deal between the team and Sommet Group of Tennessee, LLC, which purchased naming rights to the venue. The company and the team had a dispute over payments for the agreement. Company officials said the Sommet Group had accomplished its business objectives with the three-year agreement under which the arena was known as the Sommet Center. The Nashville Hockey Club filed suit in Chancery Court in November, claiming non-payment from the Brentwood-based company. Nashville, Tenn. - The Sports Authority that oversees Nashville's Sommet Center arena has given Predators lead owner David Freeman until March 5 to resolve a federal tax lien or it will enact lease provisions that would prevent the team from leaving over the next two years. The Sports Authority announced its response to a $3.3 million tax lien against Freeman. Freeman appears to be in default of his personal guaranty to the city due to the lien. According to recommendations proposed by board member Lauren Brisky and adopted by the entire Sports Authority, Freeman has until March 5 to cure his lien. If the lien is not taken care of, the remaining Predators owners must provide the city with guarantees that they can cover Freeman's personal guarantee to the Metro government. Brisky disclosed that she had met multiple times with Freeman and NHL Commissioner Gary Bettman on the issue of the tax lien. Bettman requested that the Authority provide the Predators with more time before taking any action against Freeman or the team. Additionally, Brisky's recommendations included a provision that the Predators would provide written acknowledgment that they waive their early termination rights for 2010 and 2011. If the team exercises its early termination clause, Metro would be due $20 million. Although Freeman has still not cured his tax lien, which stems from 2007, he did provide the Sports Authority with a letter certifying that his personal net worth is greater than $29.8 million, which is twice the maximum amount defined in his personal guaranty. The Sports Authority was also provided with a letter from the accounting firm Carr, Riggs & Ingram detailing Freeman's efforts to cure his lien. According to the letter, Freeman is waiting on a ruling from the Internal Revenue Service. Freeman has deposited funds with the IRS necessary to satisfy his 2007 tax obligations, if he receives a favorable ruling, according to the letter. Predators owners signed guarantees totaling $50 million to the city in 2007, when the team and Mayor Karl Dean's administration agreed to more favorable lease terms at the Sommet Center. 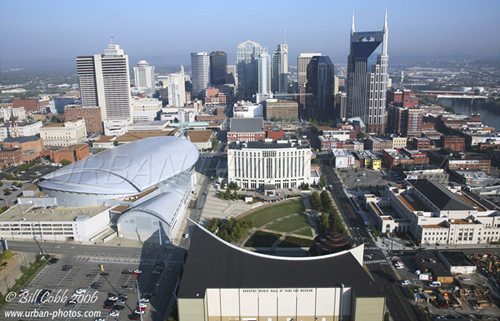 Nashville, Tenn. - Bridgestone Americas Inc. has purchased naming rights to Nashville's arena under a new five-year deal. Terms of the agreement were not disclosed. The venue's name will change from the Sommet Center to Bridgestone Arena. The team's relationship with Sommet soured recently over a disagreement, but both sides stepped back and agreed that the team could find a new sponsor. The deal with Bridgestone is expected to be larger than the current agreement with Sommet, although terms of that three-year deal were never officially made public. Estimates placed the Sommet deal at $2 million to $4 million a year, while the agreement with Gaylord was for $80 million over 20 years. A previous agreement with Gaylord Entertainment Co., reached in 1999, was terminated after five years. The Predators receive 100 percent of the naming rights revenue, according to the lease agreement reached with the team and 2008. Bridgestone has had a strong interest in sports marketing. It sponsored the Super Bowl halftime show this month and is also a corporate sponsor for the NFL, NHL and NASCAR, among other sporting interests. Nashville, Tenn. - The new chairman of the Nashville Predators, Tom Cigarran, plans to open talks soon with Metro Sports Commission about the team's lease at Bridgestone Arena. The current lease terms, agreed upon shortly after Mayor Karl Dean was elected to office in 2007, are set to expire in 2012. But Dean is facing a tight Metro budget where the Predators subsidy could become one of the central issues. Last year, Metro provided a $7.4 million direct subsidy to the team for operating what is now Bridgestone Arena. But that money came from a portion of the city's hotel/motel tax, which will now be used to pay the debt on the recently approved $585 million downtown convention center. The remainder of the $8.8 million subsidy came from a portion of non-hockey revenue the team was able to keep under the 2007 deal. Nashville, Tenn. - The Nashville Predators have reached an agreement with the Metro Sports Authority to remain in Bridgestone Arena for another two years. The two sides have been at odds since last fall when it was reported that lead investor David Freeman was under a $3.3 million federal tax lien. Another investor, William "Boots" Del Biaggio, was convicted of fraud on another matter last year. The $3.3 million lien against Freeman's Oak Hill residence had not been released by the IRS, according to the Davidson County Register of Deeds office. Representatives for Freeman said he is diligently pursuing the matter and has deposited the necessary funds to clear up the issue, should he be granted a favorable ruling by the IRS. Team managers said other members of the ownership group are not negotiating to buy Freeman's 33 percent stake in the franchise. The owners agreed to annually submit a certified net worth statement, showing that each has enough equity to cover their portion of the $31.25 million without counting their stake in the team as an asset. Nashville, Tenn. - The Nashville Predators have struck a deal with the Metro government to remain at Bridgestone Arena at least until 2012. The new agreements were put in place to cure a potential default incurred by lead owner David Freeman. Freeman was not required to sign a new contract. The remaining members of the team's local ownership group signed new guarantees to the city totaling $31 million to cover Freeman's personal guaranty. Last year, it was learned that Freeman had a $3.3 million federal tax lien against him, which triggered a potential default of his contract with the city. After the tax lien came to light, Tom Cigarran replaced Freeman as the owner group's chairman. The Sports Authority voted to accept the signed agreements, though one issue remains. Predators owners agreed to provide the city with new statements of certified net worth. The new net worth statements, which will exclude each owner's stake in the team, will be provided to the authority by May 1. Ed Lang, president of business operations for the Predators, told the authority that Bridgestone Arena is operating at its highest level ever. 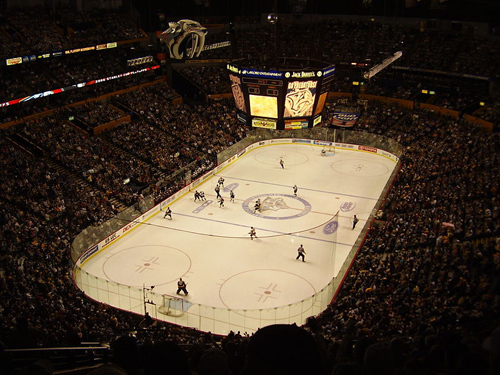 During the 2006-07 season, before the team's new lease agreement with the city went into effect, the arena brought in $16 million in non-hockey events. In the past year, Lang said, those revenues had jumped to $26 million. Cigarran said the ownership group planned to be more aggressive securing capital projects at Bridgestone Arena. Nashville, Tenn. - Bridgestone Arena and LP Field both saw their playing surfaces covered in water after 13 inches of rain fell on the Nashville area in two days and forced area rivers well beyond their banks. The Cumberland River, which flows past downtown, crested 12 feet above its flood stage, causing the venues to be overcome. Bridgestone Arena had up to a foot of standing water throughout the event level, which includes where the ice would be during hockey games, according to Predators senior vice president Gerry Helper. The team said the floor, carpeting and walls sustained extensive damage. "It seems to be coming in faster than we can pump it out," Helper said during the event. "My understanding is that the water is actually coming up from below, up through the drains. It's not like it's coming from street level and down." There are no events scheduled at the arena until May 22. Water began to rush onto LP Field's playing surface Monday, reaching approximately six feet high and nearly reaching the first row of seats. As water receded, officials determined that the damage was not severe and not expected to cause major problems. A nearby Nashville Electric Service substation had to be shut down because it was being threatened with flood waters, according to Robbie Bohren, the Titans' director of media relations. When the substation shut down, it cut power to the stadium's pumps. That led to flooding of the service entrance, followed by the playing field, which sits at the lowest point of the complex. Large trash cans were bobbing on the field and blue pads that line the inner concrete wall of the field were torn off and floated like rafts. Lots R and N were completely under water. Ballparks at Belmont University and Vanderbilt University were also both flooded. Belmont moved a double-header to Lipscomb University in Nashville and Vanderbilt canceled its final two games of the season. The Nashville Predators took a step toward long-term financial stability when the hockey franchise's local ownership group completed the refinancing of a 3-year-old $75 million loan, according to The Tennessean. Predators Chairman Tom Cigarran said refinancing the debt allows the team to recruit additional local investors and begin negotiations with Mayor Karl Dean about extending the Bridgestone Arena lease agreement that expires in 2012. Cigarran said he would like to begin talks with Dean's administration in the spring about a new agreement. Nashville, Tenn. - The Tennessean says after years of struggling to justify the utility bills during the months when the Predators weren't playing, Bridgestone Arena is enjoying an impressive run. The arena hosted 75 non-hockey events in 2009 and 71 in 2010, and it has set gross ticket sales records for the building each of the past five years. From 2005 to 2008, the arena never held more than 63 non-hockey events in a year. In 2010, thanks in part to Garth Brooks' nine flood recovery benefit shows, it was the sixth-busiest concert venue in the United States, according to Pollstar magazine. "There was a time when we wouldn't have done three shows in a week," Sean Henry, chief operating officer of the Predators and Powers Management, which runs the arena under a contract with Metro, told the newspaper. "Now we don't even think about it," Brock Jones, vice president for booking, told the newspaper. Even a longtime critic of the arena's management said there's nothing to complain about these days. Metro Sports Authority member Steve North, who has been skeptical at times of the Predators' lease with the city and their compliance with its terms, told Henry after a recent authority meeting, "Y'all are doing a great job." "From everything I've been able to observe, the arena is doing very, very well," North later told the Tennessean. "It appears to be becoming one of the premier venues in the country. When you consider the state the economy's been in, that's pretty remarkable. I'm very pleased." According to data submitted to the sports authority, the building operated at a $3.4 million loss from July through January, compared with $2.8 million from the same period a year earlier. Powers Management budgeted a $4 million loss for July through January and $6.7 million for the entire fiscal year, which ends June 30. The newspaper said several factors have come together to create the arena's new level of activity, but one of the biggest is management's $2 million incentive to keep the place humming. Lease renegotiations in 2007 between the Metro government and the Predators' new ownership, led at the time by David Freeman, created an incentive of up to $2 million a year for the team, on top of $6.8 million in other taxpayer-funded subsidies and lease concessions. The fee, which the Predators have maxed out for the past three fiscal years, comes from a portion of certain revenues the arena generates above 2006 levels. In other words, the busier the building is, the better the Predators do financially, the newspaper said. 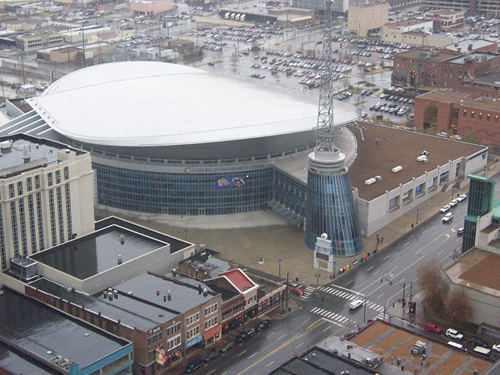 Nashville, Tenn. - Plans to extend the concession contract with Sportservice for Bridgestone Arena to 2043 have come under scrutiny as documents uncovered by a local television station suggest a better deal might be available. WTVF says letters from Aramark and comments from Centerplate executives suggest they wanted to bid for the agreement, but did not have the opportunity. The television station said the Predators, which oversee arena operations, told the Nashville Sports Authority that no better deal could be made. At the July meeting of the Nashville Sports Authority, Predators President Sean Henry was asked if he had contacted Delaware North's competitors about the concessions contract he was proposing, the television station said. "We reached out to each and every one of them," Henry insisted, explaining that none of them thought they could serve up a better deal, WTVF reported. "What we built with this deal was the best of all those conversations. It can't get much better than this. I think their exact quote is 'stop calling us.'" But in an August letter obtained by the television station under Tennessee's public records law, a senior vice president for Aramark wrote to Predators CEO Jeff Cogen that he was the one calling after having learned about the "proposed new agreement." The letter insisted that Aramark was actually prepared to offer "enhanced economic terms" with a "greater capital" investment in the arena. It ends, "I hope that you will reconsider our offer." The company that provides concessions at LP Field, Centerplate, told WTVF earlier that it would also like to have a chance to compete for the arena's business. The television station's reporting on the original agreement resulted in a new deal. Instead of the 32-year extension originally proposed, the new plan would give Delaware North the city's concessions business for 12 more years - in exchange for the company spending more than a million dollars on new high-tech cash registers and other improvements. But it will also give the company the right, if the Predators leave, to completely walk away from the arena - leaving the city without a concessions operator, WTVF reported. A deadline for Metro to tell the Nashville Predators if it plans to terminate the hockey team's lease incentives was extended by about four months, allowing more time to negotiate new terms. The Predators, whose sister company manages Bridgestone Arena under a contract with Metro, reached a new lease agreement with the city after a mostly local ownership group bought the NHL franchise in 2007. The deal included taxpayer-funded subsidies and incentives for the organization to keep the arena busy year-round with as many concerts and other events as possible. Those terms, which are worth an estimated $7.8 million this fiscal year, are set to automatically renew June 30 unless Metro gives the Predators notice of termination. The deadline for giving notice had been Dec. 31, but the Metro Sports Authority agreed to extend it to late April. Mayor Karl Dean's administration said it will work with the Predators on a new incentive package that will offer less city money up front. Nashville, Tenn. - One of the benefits to the continuing partnership between the Nashville Predators and Bridgestone Americas could be bringing a National Hockey League All-Star Game to town, perhaps in two or three years, The Tennessean said. The Predators and Bridgestone Americas announced a five-year extension for the Bridgestone Arena's naming rights that will go through 2019. The announcement came less than two years into the existing five-year contract between the Predators and Bridgestone. Bridgestone Americas has invested heavily in the NHL overall as well. The locally based company is the league's official tire and is the title sponsor of the popular Bridgestone Winter Classic, an outdoor hockey game held on or near the New Year's holiday. "We're going to do what we can to bring an all-star game here," said Gary Garfield, chief executive officer of Bridgestone Americas. The Predators have already had informal discussions with the NHL about hosting an all-star game for either the 2013-14 season or the 2014-15 season, CEO Jeff Cogen said. 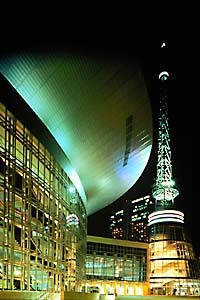 The anticipated opening of the Music City Center in 2013 would allow for the additional fan activities and programs that surround the all-star game and with the Omni Hotel could accommodate national and international fans and news media. Nashville, Tenn. - The Nashville Predators and Mayor Karl Dean's office are close to completing negotiations over a new Bridgestone Arena lease deal, which will diminish the city's subsidy to the hockey team in the short term in favor of an incentive-laden deal built to last through 2028. Predators executives talked with The Tennessean's editorial board to tout a new economic impact study for the arena and express optimism that a new lease agreement was close, the newspaper said. Predators CEO Jeff Cogen offered little detail, but said the new deal would provide incentives for the local ownership group and Metro to split incremental revenue increases generated at the downtown building. "Our intent is to create an agreement that is a mutually beneficial public-private partnership that survives the existing term of the deal," Cogen said, referring to the current lease deal that runs through 2028. The Predators released the full economic impact report, which was conducted by Leib Advisors. An executive summary had been released to local media last week. Bridgestone Arena has an annual economic impact of $410 million and has created 2,350 local jobs, according to the report. Cogen said the report demonstrated the value of the arena and the hockey team to the local economy. Even still, he acknowledged that the new lease agreement will diminish the guaranteed public dollars going to the local owners. Cogen said negotiations are about 80 percent complete, and the two sides planned to meet again. "Guaranteed dollars that come to the team are going to be reduced," Cogen said. "That was a stated goal of the mayor's office, and we want to be good partners." In 2007, Metro and the Predators' owners, led by David Freeman, struck a deal that pays the ownership group $7.8 million annually in subsidies, management fees and incentives. Though both sides claim the deal was a success, things have changed over the past five years. The sagging economy has taken a toll on Metro's budget, and the way Metro funds the subsidy has changed as well. Metro previously paid for the subsidy with tourism taxes and fees, but those funds have since been committed to pay debt on the new convention center. That means Metro has been paying the Predators and the affiliated arena operator, Powers Management, out of its general fund. Under a bill making its way through the Tennessee legislature, sales taxes from non-hockey events at Bridgestone Arena would no longer go to the Predators. Instead, it would go to Nashville Sports Authority to help pay the cost of the arena, WTVF reported. Team officials told the television station the money was needed to get the franchise on its feet, but losing the nearly $2 million a year now won't be an issue. Nashville, Tenn. - After construction on the new convention center and its headquarters hotel is finished next year, The Tennessean says Metro Nashville government is expected to turn its attention to possible renovation projects at Bridgestone Arena. The convention center fronts Bridgestone Arena, but the arena's entrance there is modest compared with its "front" entrance, making it a very likely choice for a renovation project. Predators Chief Operating Officer Sean Henry said Bridgestone Arena's current back door could become its front door with the thousands of convention center visitors expected each year. "We believe that as construction of the Music City Center and Omni hotel near completion, attention will shift to the arena," Johnson said. "Renovations would offer exciting potential development that would further enhance our downtown and appeal as a vibrant, dynamic city, but there are no such immediate plans as those have been long-term discussions." Predators Chairman Tom Cigarran said the local ownership group has considered at least three possible renovation projects for the arena, but he would not go into specifics. The Predators have identified at least $13 million worth of ongoing capital needs inside Bridgestone Arena that have gone unaddressed in recent years. As part of negotiations with Dean's office, the Predators have explored the possibility of adding a ticket tax similar to the one the Titans charge fans to fund projects at LP Field. Henry called such a tax a "neat idea" last year. "We are looking at ways to address the capital needs associated with the arena," Johnson said. "A seat user fee has helped us meet our capital needs with the Tennessee Titans in a way that protects taxpayers by having the users cover the costs. We are currently in similar discussions with the Predators."